In our Madera grade, Walnut will contain a range of color, unlimited sap wood (normally a small amount), numerous knots both sound and open up to 2” in diameter, and holes up to 3/4” in diameter, some cracks and pith, along with other occasional character marks. Lengths of planks vary from 1’ to 10’, with an average of 5’. 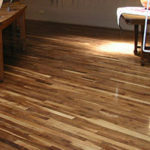 Madera grade Walnut results in a floor with overall dark color, interesting grain, and numerous knots. 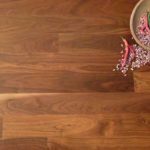 Our Walnut Casa grade flooring in 2-1/4” will have color variation including a mix of the lighter sapwood and darker heartwood, knots up to 1-1/2” in diameter, along with other occasional character marks. Small open holes up to 1/4” in diameter are also allowed. We do not allow any edge defect. Lengths of planks vary from 1’ to 10’, with an average of about 4’. Our Hacienda Walnut is comparable to Select and can contain occasional ½” sound knots. 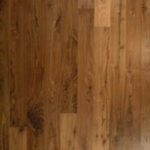 Sapwood content can be 30% of the total surface area of the floor. No single plank will contain more than 40% sapwood. All our Walnut is steamed, giving the sapwood a creamy tone. Lengths will vary from 1’ to 10’ with an approx. 3.5’ average length. Our Buckboard flooring features a special surface texture that preserves some of the random circle-saw and band-saw marks that were made when the log was first cut into boards. These sawmarks are subdued with our process of wire-brushing and polishing. A bevel on the sides also softens the edges of the planks. A staining process that accentuates the saw marks can be done during installation. 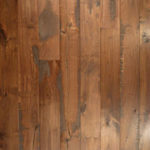 Buckboard flooring results in a rustic antique look, featuring some original saw marks, but still designed for everyday living. Contains: circle-saw and/or band-saw marks; some small areas of overwood and underwood where deeper saw marks occur; color variation; knots up to 2” in diameter; open holes up to ¾” diameter; cracks which don’t compromise the integrity of the flooring; other character marks.. Any defect found in rough lumber such as crayon marks and watermarks can occur near sawmarks. The rustic character is allowed anywhere on the face of the planks. Lengths of planks vary from 1’ to 10’, with an average of 5’.